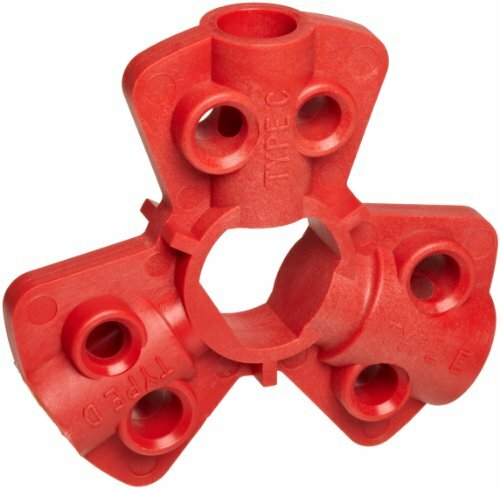 Brady 64221 pneumatic quick-disconnect lockout for use on 1/4", 3/8" and 1/2" male air hose fittings (1 pack). Our pneumatic quick-disconnect lockout is applied to the male fitting, isolating equipment from all compressed air sources. Device accommodates the majority of 1/4", 3/8" and 1/2" male fittings. Hole in center of device allows for permanent storage on an air hose and a loop on the side can be used to hang the hose and lockout device. Lockout accepts padlocks with 1/4" or 9/32" shackles and is sold 1 per package. Air line and pneumatic lockout type of device. Color is Red.